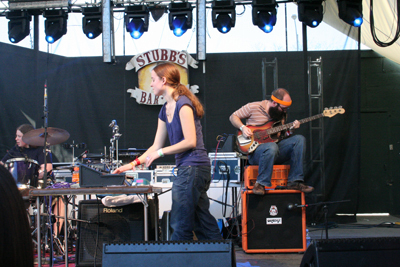 We got up early, and went to Stubb's for a high noon show where Black Moth Super Rainbow was playing. WOW! They were so smooth, and so gorgeous, and so psychedelic in a Sesame Street, brightly colored sort of way, with just the right amount of woebegone sadness, that I could barely stand it. Their drummer was the best part; there are few drummers I have seen that play with such individual, convincing style who are truly a joy to watch. She was so solid, and so smooth and precise, like a metronome, with just the right amount of phrasing and accenting. She wasn't playing the drums, she was making the drums speak. I bought their album and put their song on my myspace profile promptly. Next we went to the Mohawk bar to go to that party that Angela thought was the day before. They served mushroom and pepper fajitas that were mouth-watering. I had two and we sat in the nice shaded rooftop room on the top of the Mohawk before going on our way. We went back to the convention center at one point, and I bought those Leia Bell tiles I'd been lusting after on Friday. I also watched sort of a lame seminar on "Obstacles to Touring Internationally"�I thought they'd be talking about obstacles like, how the hell do you get on with a booking agency, which is about as hard as getting signed to a label? But they were talking about the legal ins and outs of getting work visas. You know, possible things. Angela saw an interview with Ice Cube, where he talked about one of his upcoming product lines. You'll have to talk to her to find out more. We stayed there for quite awhile and then went back to the Mohawk to maybe snag some more fajitas, but the line was too long, and we walked to Waterloo park, where we walked like 10 miles around the chainlinked perimeter trying to find the entrance. I bought some sunglasses for $5 because I forgot to bring my sunglasses from home and we did have one Cool Moment ... we saw that band Fucked Up from the Vice party playing again, and Keith Morris [Circle Jerks, Black Flag] got onstage out of the blue and started singing some classic Black Flag and Circle Jerk tunes. . It was the most random experience. You see so many amazing things at SXSW that it all becomes a blur after awhile. It's where I expect to see Elvis resurrected. Our friend Chase dove into the mosh pit for a few minutes and then we walked back down to Sixth Street, the main drag. We whisked off to watch a PHENOMENAL documentary about Joy Division called, simply, Joy Division. It was beautifully shot, beautifully grainy and expressive and abstract at all the right points and with great interviews and comments from the remaining members of the band. 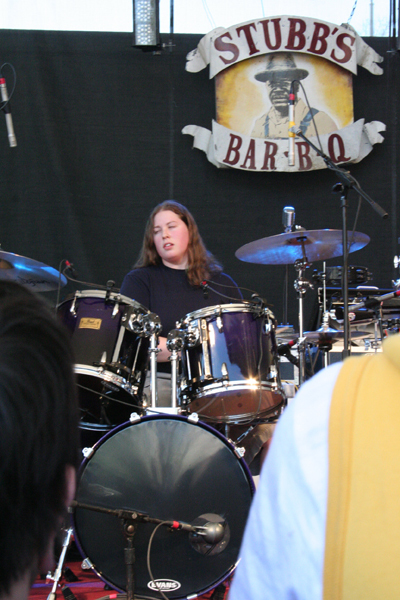 Also, there was some incredible live footage of the band, with Ian's trademark jerky, flailing dance moves. The documentary did a great job concentrating on the actual music of JD, how it evoked the modern sterility of Manchester; the releases, the new sound that JD introduced. They just briefly touched on Ian's epilepsy and personal problems, but explained enough that it all tied together beautifully in context. I haven't seen Control yet, so can't make comparisons, sorry. This night we were a little bit lame; we wandered around and tried to drop into this show (I think it was either Dreamend or Experimental Aircraft that was playing) that Black Moth Super Rainbow was going to be playing later and it sort of was boring, and then we walked by another club where Mike, a former Salt Laker, was playing with his band. They sounded good, but we didn't get much of a chance to stick around because we really really really wanted to get in to see Jarboe, and weren't sure how hard it would be to get in. Turns out it wasn't going to be that hard, but we got there two hours early and enjoyed the two-piece Nadja from The End Records with their dirgey, multilayered instrumental drone rock that was elegantly atmospheric and had nothing resembling what you might call a "groove," and suffered through Tub Ring, who is sponsored by Mountain Dew and who we didn't like at all. After the 20th time the keyboard player jumped off his stand, I started to get a little bored. Don't get me wrong, the first 20 times were amazing. They were cacaphonous ska, almost like the Blue Meanies but not good. A girl in the audience knew all the words and was singing along and I ... just ... didn't ... understand. It had lots of different movements and was very circusy and tiresome and I want to stop talking about it now. Jarboe was beyond amazing, of course. She sang with so much pain; you could hear it in her voice like it was wrenched out of her body, and in her face; her rapidly blinking eyes and upturned face and lips pulled back in a grimace. She was channeling fertility goddesses and harvest moons and sons and daughters and battlefields. A sole acoustic guitar player accompanied her as she swayed on the stage and stepped out into the audience. The crowd formed a circle around her, and there was so much profound respect coming from everyone and a very intimate feeling. There were hardly 50 people in the entire room, and only about 15-20 standing near the front. Angela stood literally a foot from Jarboe as she sang like the sound of kingdoms rising and falling. She is truly timeless. After Jarboe, Angela and I were feeling mighty sick from the flu, thought about going to see Chromeo and instead opted to eat a burrito on the street. We got a call from Jaime Gadette who was at a club that gave her card to someone else (!). Hello! That's terrible. I lent her money so she could get a cab home to her hotel. Then we went home "early" (like 1 a.m.) and went promptly to bed, hacking and coughing and sniffling.